Like real-world automobiles, it is to be assumed that spaceship design will go through eras where particular colours and shapes go in and out of fashion. 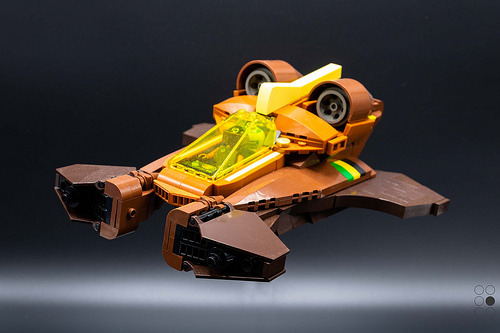 Well, according to Cole Blaq‘s latest LEGO starfighter, brown will definitely be cool again in the future. The rich chocolate tones of this creation offer the perfect contrast to the trans-yellow canopy, and the stripes at the rear add a nice little splash of brightness. Couple the striking colour scheme with some sweet curves and effective greebly details at the front and you’ve got a wonderful design which manages to look both futuristic and retro at the same time.